World powers say they will back Libya’s new government in its bid to lift a U.N. arms embargo, a move that could help the government combat internal security threats and fight Islamic State. Secretary of State John Kerry announced the decision following a multi-nation meeting chaired by the United States and Italy. The United States and the international community “stand ready, to provide humanitarian, economic and security support to the new Libyan government,” Kerry said. But he said world powers are not talking about troops or “boots on the ground” in Libya. The internationally recognized Government of National Accord is facing challenges from rival factions and Islamic State-affiliated militants who have established a base in the central city of Sirte and have used that base to launch attacks in neighboring Tunisia. In a joint news conference Friday, Libyan Prime Minister Fayez al-Sarraj described the situation in his country as “bad” in terms of the economy and security. He urged world powers to provide additional training and equipment for Libyan forces, saying Libya’s neighbors would not be “spared” if terrorism grows inside the country. “Libya is a keystone for access to the Sahel, the Maghreb, the Near East and the Mediterranean and Europe and to have Daesh have a foothold in Libya is bad for everybody,” he said. Libya has been grappling to overcome the chaos that followed the 2011 ouster and killing of leader Moammar Gadhafi. World powers are hoping the Government of National Accord can unite the country. Representatives from 19 other countries in the region joined the talks, along with the United Nations, African Union, EU and Arab League. 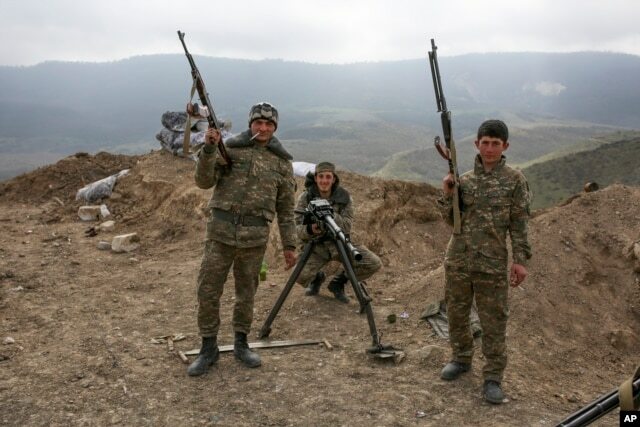 Another focal point was a multi-national effort to help stabilize Nagorno-Karabakh, an ethnic Armenian enclave within Azerbaijan that was the scene of intense fighting in April. The two countries accused each other of violating a cease-fire. The flare-up was partly fueled by a worsening economic situation in Azerbaijan because of the fall of oil prices. Monday’s sessions are the first time the presidents of Armenia and Azerbaijan have met since the flare-up. A senior State Department official said the United States wants both countries to re-commit to a 1994 cease-fire agreement and a negotiating process that will lead to a comprehensive settlement. “We would like to see an outcome where the presidents agree to certain steps that can reduce tensions along the line of contact,” the official said Monday. The official, who spoke before the talks, also said the Organization for Security and Cooperation in Europe needed enhanced monitoring for violations in the disputed region. The U.S., Russia and France serve as co-chairs of the OSCE Minsk Group, which has been working to find a peaceful solution to the Nagorno-Karabakh conflict. The talks in Vienna follow Kerry’s visit to Saudi Arabia, where he sought that government’s support in strengthening a ceasefire agreement between Syrian government forces and rebels before broader talks on Syria. Tuesday, the 17-nation International Syria Support Group will convene in Vienna to discuss the stalled political talks, difficulties in maintaining the February cease-fire and uneven U.N. results in delivering humanitarian aid. U.N. Syria envoy Staffan de Mistura has indicated he will await the results of the meeting before setting a date for the next round of proximity talks between the government and the opposition. Kerry will also attend a NATO ministerial meeting in Brussels and then will travel to Burma in a show of U.S. support for the country’s newly elected government.